Walter J. Smith spent his early life in Oklahoma with his family as a farm hand. Smith only obtained a grammar school education most likely because his family needed help on the farm during the Dust Bowl. It is highly likely that the Smith family moved to California during the economic and environmental hardships of the 1930s, like many Americans did in this era. Once in California, he continued to work as a farm hand, possibly in the grape and citrus industries. By 1943, Walter Smith resided in Napa County, California. He was drafted to join America’s armed forces. When he reported for duty in San Francisco on March 24, 1943, he was single with no dependents. Even before Pearl Harbor, California was preparing for the war to reach the United States. Many cities in the state forced locals to practice blackouts. At night, special curtains were used or windows were colored in black to stamp out any ounce of light. This rendered the buildings invisible to enemy planes and ships targeting the urban populace. Lookout stations were set up all along the coast. Young children were trained to identify and report any enemy ships or aircraft that they saw from their watch tower lookout posts. During World War II, California came together to meet the war’s need for food. Civilians, even children, recycled as much as possible and all the money went to the war in one way or another. As the military needed more food, civilians were encouraged to grow their own. By 1943, one-third of all vegetables Americans ate were raised in “victory gardens.” Certain goods, such as butter, sugar, and gasoline, were rationed. The state also became a training center for the U.S. Army, U.S. Navy, and U.S. Marine Corps. Since California’s terrain is largely diverse soldiers were able to train in deserts, mountains, and beaches. By the end of the war, there were over 140 military bases. New factories made products for the defense industry, including weaponry and steel for airplanes and Liberty ships. California shipyards built over 1,500 ships during the 1940s. More planes were built in California than any other state. Because most men were drafted, women were hired to fulfill the labor shortage until the soldiers returned from overseas. The 4th Infantry Division, led by Major General Raymond O. Barton, moved to Fort Dix, New Jersey on April 12,1943, three weeks after Private First Class Walter Smith reported for duty. The 4th Infantry Division practiced their battlefield maneuvers in Florida in September 1943 and continued their training at Camp Jackson, South Carolina. Before going overseas, the division was briefly stationed at Camp Kilmer, New Jersey. The 4th Infantry Division left the U.S. at the New York Port of Embarkment on January 18, 1944. Eight days later, the division arrived in England. From late January to early June 1944, the division adjusted to the new climate and continued to work on their physical conditioning. On June 6, 1944, the 4th Infantry Division landed on Utah Beach as the spearhead of the seaborne assault in Normandy. The 4th Infantry Division landed at Utah Beach on D-Day and led the assault up the Cotentin Peninsula. They faced the significant obstacle of General Erwin Rommel’s heavily fortified Atlantic Wall and then fought their way up the Contentin Peninsula. On June 27, 1944, they liberated the port of Cherbourg. This particular battle was important because food, fuel, and ammunition were short. Having access to a deep water port would allow the Allies to strengthen their supply lines. Private First Class Smith fought through dense hedgerows, took part in night patrols, and likely coped with the loss of his fellow comrades. 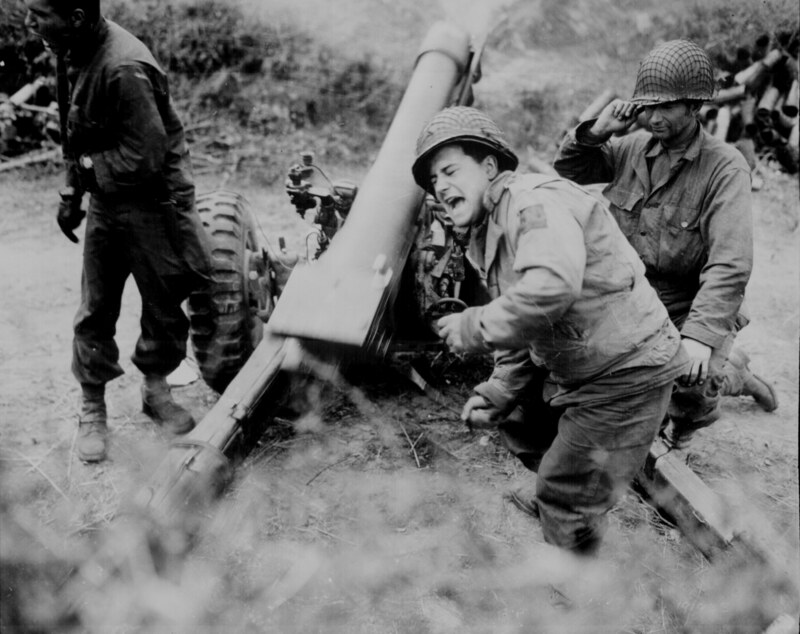 After fighting near the Périers between July 6-12, the 4th Infantry Division broke through the German lines on July 25, 1944. Operation Cobra was launched. While pushing further south, the 22nd Infantry Regiment and Private First Class Smith faced another enemy counterattack in the Percy sector. 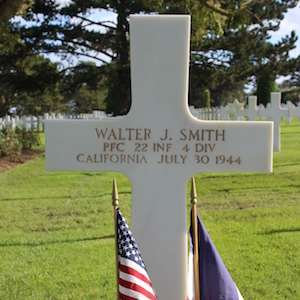 On July 30, 1944, Private First Class Walter J. Smith was killed in action at age 20. 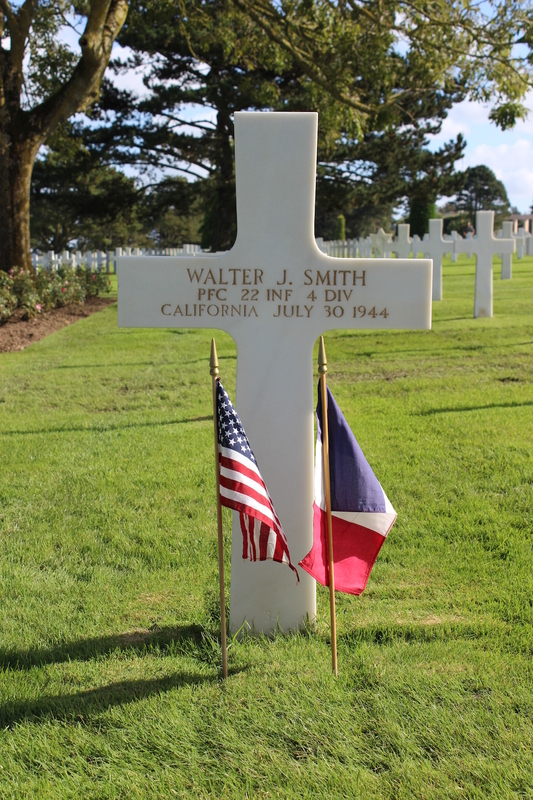 He was awarded a Purple Heart and is buried in Colleville-sur-Mer at the Normandy American Cemetery. This eulogy is in admiration of Walter J. Smith, Jr., who gave the greatest gift an American can give to his country, his life. The definition of “sacrifice” cannot even illustrate what this great man did. Walter J. Smith lived with his father, Walter A. Smith, in a small town of Oklahoma. Smith had the simplest education before withdrawing to stay at home to tend to the family farm. After the Dust Bowl of the 1930’s Walter moved to San Francisco, California. Our Silent Hero was 19 years old when he was drafted into the U.S. Army. Being a soldier meant one needed to do whatever it took to preserve the heart of America and her allies. Being a soldier means putting your brothers’ lives ahead of your own and doing the unthinkable when courage calls for it. Growing up we were always taught to appreciate the sacrifice soldiers around the world make for our freedom. We have Memorial Day in May and Veteran’s Day in November, all in an effort to recognize soldiers bravery and selflessness. Although these days are significant in remembering the sacrifice soldiers like you and your peers made for us, in reality every day should be a day of recognition and appreciation. Our names are Camie McQuarrie and Mary Jane Ford. We are both 17-year-old high school students. When we sit down to enjoy a meal with our family we might occasionally remember to consider the “cost” of the meal, the time it took to prepare, the money and energy our parents exerted to go shopping for the ingredients, the effort it requires to work to earn the money with which that food was bought. Although these factors are important, it is not often enough that we consider the true “cost” of things like a family dinner or a school field trip - or any of the freedoms we experience every single day of our lives as Americans. We now have a better understanding of what the true cost is, thanks to Private First Class Walter Smith. We now understand that he too had family responsibilities, we understand that he probably experienced both emotions of extreme fear and extreme pride throughout his life and his time in the service. We understand that he left his family behind to fight for this beautiful country and that he ultimately left his life behind as well. He sacrificed his tomorrow for our today - and we will never forget that. Although he may have not have recognized himself as a “hero,” we do. July 30, 1944, was probably a day that started off like any other day for him, but it was also the day that he too would truly understand the sacrifice he was making for his country. We would like to thank you for every single day of your life you dedicated to protecting America. You are a true hero. 4th Infantry Division insignia patch. Wikimedia Commons. 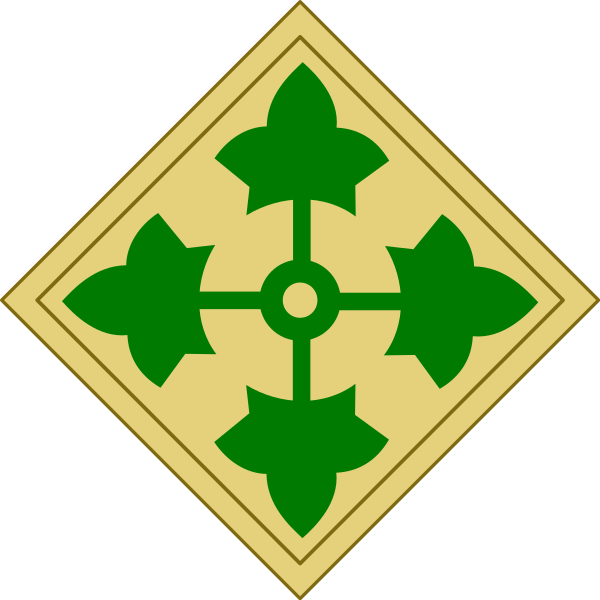 https://commons.wikimedia.org/wiki/File:4th_Infantry_Division_CSIB.svg. Walter Smith. Headstone and Interment Records for U.S. Military Cemeteries on Foreign Soil, 1942-1949. Digital Images. http://ancestry.com. Walter Smith; World War II Army Enlistment Records, 1938-1946 [Electronic File], Record Group 64; National Archives and Records Administration [retrieved from the Access to Archival Databases at https://aad.archives.gov/aad/, January 7, 2017]. “Division History.” Updated 2017. Accessed September 29, 2017. National 4th Infantry (IVY) Division Association. http://www.4thinfantry.org/content/division-history. Harrison, Gordon A. The European Theater of Operations: Cross Channel Attack. Washington, D.C.: U.S. Army Center of Military History, 1993. https://history.army.mil/html/books/007/7-4-1/CMH_Pub_7-4-1.pdf. Map, 4th Infantry Division on D-Day. U.S. Army Center of Military History. Updated 1990. Accessed October 4, 2017. https://history.army.mil/books/wwii/utah/maps/MAP8.JPG. Utah Beach to Cherbourg. Washington, D.C.: U.S. Army Center of Military History, 1990. https://history.army.mil/books/wwii/utah/utah.htm. "Walter J. Smith." American Battle Monuments Commission. Accessed January 7, 2017. https://abmc.gov/node/413694#.Wcuam7KGPIU.